Tufts Wildlife Clinic was established in 1983 as an integral part of the Cummings School of Veterinary Medicine at Tufts University. 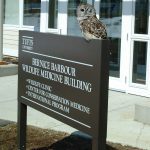 As a regional resource for information related to wildlife health for the general public, wildlife biologists, veterinarians, health professionals and others, Tufts Wildlife Clinic is comprised of the latest diagnostic, medical and surgical capabilities to house and treat a broad range of sick and injured native wildlife. Learn more about our mission and history. Meet our staff and specialists at Tufts Veterinary Clinic. The Bernice Barbour Wildlife Medicine Building on the campus of Cummings School of Veterinary Medicine at Tufts University is the home of the Tufts Wildlife Clinic. Learn more about the clinic’s mission, vision and history. 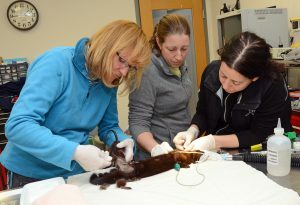 Tufts Wildlife Clinic staff includes faculty members, staff, veterinary technicians and interns.